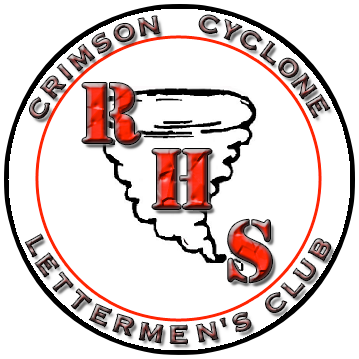 We invite you to become a member of the Crimson Cyclone Lettermen's Club. The intent is to get all former Russellville Cyclones and their supporters in the same fold--one spiced with fellowship and lined with brass plates. There will be an endowment element to the organization, but it is being formed primarily to promote fellowship among former Cyclones. It is not a competitive or alternate organization to the other Cyclone booster clubs. It is meant to add to what they do. It is open to all former athletes, male or female, who have ever earned a varsity letter at Russellville High School in any sport. Former coaches of any sport are also welcome. Membership is very affordable. A lifetime membership can be obtained for a one-time donation of $100. It that's too big of a hit, your membership fee can be paid out in installments of as little as $10 per year. As far as financial commitment, that's it. None of the membership fee goes to the operating expenses of the CCLC, which will be fueled by a board of directors. All membership fees go directly to a permanent endowment fund that will be established to benefit all RHS sports programs. The endowment will be administered by the Pope County Community Foundation, an affiliate of the Arkansas Community Foundation. Therefore, all gifts are tax-deductible. And, as most know, with an endowment, the principal is never used; only the interest earnings are distributed. One contribution will help out forever. As the endowment grows, it can provide thousands of dollars per year, every year, in supplemental revenue for the athletic programs at Russellville High School. The money will be used for all sports. Distribution of earnings will be determined each year by the CCLC's board of directors based upon needs and recommendations of both the Russellville athletic staff and Lettermen's Club members. For people who want tangible results, it will be done with brass plates. One of the goals of the Lettermen's Club is to establish a "Lettermen's Wall" inside Cyclone Gymnasium. Each club member will have a brass plate inscribed with their name and sports and the years that they lettered or coached. The CCLC is expanding the tent beyond Lettermen. Businesses and other Crimson Cyclone supporters, who are not letter-winners, can help out by giving an endowment. They will have a brass plate placed on a separate plaque. You can give to sponsor memberships for deserving youths. Also, a membership makes a great graduation or birthday gift. We invite you to join us now, as we show our Cyclone pride. Click here to download the Letterman application.